Acer was early to the Chromebook market, releasing the C7 for a mere $199 and the C710 for $299. These laptops – more tablets with keyboards than fully-featured machines – work well as “third screen” devices that you throw onto a coffee table or use for browsing and some mild document editing. Now Acer is back with the C720, a $249 with SD card reader, USB 3.0 port, and a front-facing HD webcam for video chats. The new laptop now competes in the same space as the Pixel, a handsome Google-branded device, and the new HP Chromebook 11, an ultralight laptop that charges via Micro-USB. That doesn’t mean Acer’s creation is overrun with competition, it simply changes the space slightly. 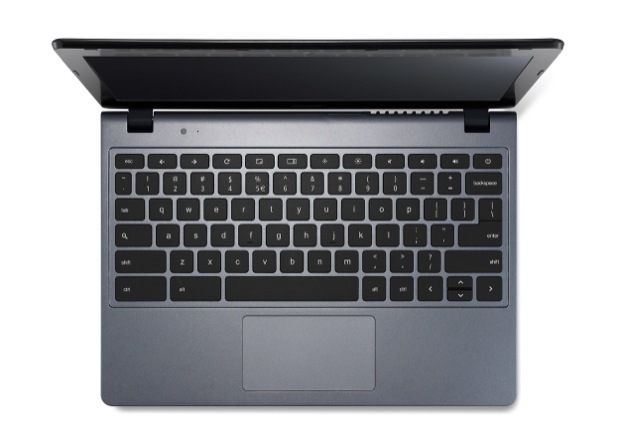 While specs rarely matter in the Chromebook world, the C720 holds its own with 8 hours of battery life, 4GB memory, and a solid Intel Celeron 2955U processor with Haswell micro-architecture. It shares the same style case with its older brothers yet is slightly thinner and weighs less than 3 pounds. Is this the Chromebook for you? The question, more precisely, is whether the Chromebook concept is ready for prime time. While I haven’t yet lugged one of these on a long trip – I can imagine some frustrating moments – I can see the intrinsic value of this hardware over, say, an underpowered Windows machine. Best of all you can usually hack these and install Ubuntu Linux, thereby gaining a bit of utility and, more importantly, a command line prompt. The laptop is available for pre-order now and will be shipping in the coming weeks.